Dinorah Sapp was born in Mexico City and arrived in the U.S. when she was 15 years-old to complete her high school education at a boarding school in Texas. She then went on to complete a Bachelor’s degree in Music with a minor in Spanish. She also holds a Master’s Degree in Language Education from Indiana University. Her ESL classroom experience has been at the elementary, high school, and university levels. She has taught courses in all language skills (Reading, Writing, Speaking, Listening, and Pronunciation), as well as Spanish and Music. Dinorah participates actively in regional and international conferences. 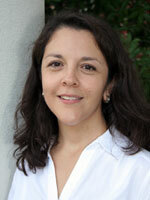 Dinorah has lived in Germany, Austria, and Ecuador, and has traveled extensively throughout Europe and Latin America. She enjoys spending time with her husband and daughter, traveling, reading, and cooking.